"The beauty of being a filmmaker is that each client and job is a different experience and requires a unique approach, all of which test my skills and passions whilst practising a craft that I love." 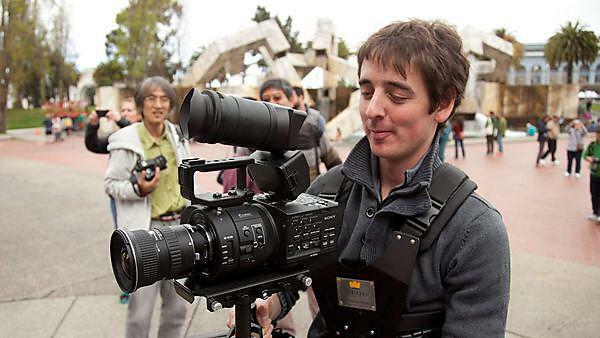 Danny Cooke is a multi-award winning freelance film-maker. He has worked on film projects all over the world: Norway, Ireland, California and New York to name a few and has also had the honour of filming famous personalities including Tom Daley, Sir David Attenborough and Michael Morpurgo (writer of War Horse). As well as celebrities, he has also created media for big clients including Sunspel Clothing, California Lottery, Jameson Irish Whiskey and many more. His 2014 film 'Postcards from Pripyat, Chernobyl' recorded the haunting landscape around the Chernobyl nuclear explosion site - Danny used a camera mounted in a drone to show the area from the air for the very first time. Danny currently works as a self-employed filmmaker and University associate lecturer. "My passion for film began when I was about 13 but I have always been interested in media of various kinds. The BA (Hons) Media Arts course supports all factors of media, while allowing you to focus on your particular area of interest, which in my case is film making and documentary. BA (Hons) Media Arts has helped me to channel my existing skills as well as developing new ones. It has led to some fantastic opportunities and new contacts which will make a great difference to my career. "The course encourages you to take your work beyond the University and I engaged in a number of professional film projects during my time at Plymouth. "My plan was always to start a freelance filmmaking business whilst I was studying at Plymouth; it seemed the best opportunity to go forward, and I was always aware that it could take time to grow. I made sure that whilst on the media arts course that I would make all the necessary contacts that would help my business thrive." "Since graduation I have been building my freelance filmmaking business. Each year I have not only worked in the UK, but I have travelled the world and visited some amazing and eye-opening places, people, and cultures. The beauty of being a filmmaker is that each client and job is a different experience and requires a unique approach, all of which test my skills and passions whilst practising a craft that I love. "As a freelance filmmaker the most difficult thing I experience on a day to day basis is a level of uncertainty. There can be weeks without work and it can get a little scary at times. On the other hand, there can be too much work and you have to turn people away. "I was always fascinated by the tragedy, so I said yes without much hesitation – not thinking twice about any harmful radiation exposure I might receive. When I was just one year old, my parents and I lived in Italy and we were directly affected by the nuclear disaster. Locals were told to throw away all their crops and anything that might be exposed to the radiation cloud. Exploring ‘The Zone’ and the abandoned city of Pripyat, Ukraine, has to be one of the greatest and most memorable experiences I’ve ever been on." "The course encourages you to take your work beyond the University and I engaged in a number of professional film projects during my time at Plymouth. In my second year I was Editor and Director of Photography on the documentary Ray: A Life Underwater. This documentary has had amazing success internationally and has been screened on Channel 4." Danny worked with documentary maker and media arts associate lecturer Amanda Bluglass on the documentary short film which won the overall festival and audience choice prize at the 2011 Shoot Film Festival, and the Award for Best Documentary at the Super Shorts International Film Festival. BBC News has also featured the film, and it has attracted global interest with internet hits topping 200,000. Danny continued his award-winning partnership with media arts associate lecturer Amanda Bluglass with their short documentary collaboration ‘Viva. Punk Rebel, 82’, a portrait of octogenarian queen of Cornish punk Viva Hamnell. "I am a very technical and practical person when it comes to filmmaking. Whilst on the media arts course, I lacked a theoretical knowledge to underpin my strengths. The University realised this and helped me to focus on my weaknesses. Now, when I frame the shot, or cut a film in a certain way, I’m able to articulate the reasons behind my choices. It has dramatically improved the way I tell a story." "One of my favourite memories is using the traditional 35mm photography developing suite on a module. I found the task of using an analogue film camera incredibly different to the digital process we take for granted today. Stills photography is not my passion; however, I believe practising this process is fundamental to improving the way we take digital stills or even video." The University of Plymouth has one of the few remaining movable-type printing workshops in the UK. As a student you can explore a range of printmaking workshops - etching, lithography, silkscreen, and letterpress. Danny made a short film about letterpress, featuring senior technician Paul Collier. Are you passionate about video or photography? Do you wish to explore the worlds of sound and animation? BA (Hons) Media Arts gives you the power to create your own unique pathway – focus on one area or work across media. We prepare you for the ever-changing media and arts industries by empowering you with the skills and confidence to find your own creative voice and push boundaries.